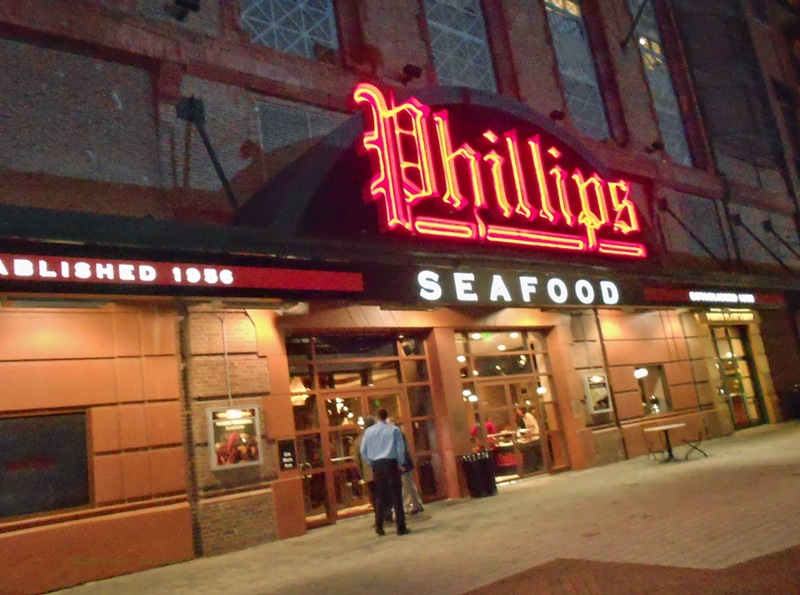 It was back in November, 2011 that Phillips Seafood Baltimore restaurant moved after 30 years from the Inner Harbor a bit east on Pratt Street to the Power Plant in a prestigious corner location which can’t be missed with its 17 foot tall Phillips sign. The new location has a richer feel with well-polished wood, mosaic tile floors, and a plush anteroom, piano bar, oversized models of Baltimore’s historic ships the Constellation and Pride of Baltimore II, and numerous photographs reflecting the history of the Phillips family that adorn the walls. Phillips Seafood in 2014 celebrated 100 years from their early start on Hoopers Island, where A. E. Phillips & Son was a processing plant for wild oysters, crabs and fish from the Chesapeake Bay and local waterways. It was the surplus catches that were the inspiration for the first Phillips Seafood Restaurant and now Phillips has grown with numerous seafood processing plants, restaurants along with their seafood for the food service industry and retail line for grocery stores. It was back in February when I was invited to come in as Phillips Seafood’s guest for a meal. With a turn of events with my husband in the hospital, our lunch was delayed. Phillips Seafood was most accommodating with the husband’s new dietary restrictions, low sodium and limited dark greens. Staffing was very communicative and adaptations were easy; a special salad with iceberg lettuce and low sodium dressing and the Simple Fish – Catch of the Day/ Swordfish with the lemon chive butter and steamed vegetables filled the husband’s tummy.